Rhode Island may be the smallest state in the union, but its vision of the future is as far reaching as the ocean lapping at its shores. Taking a page from the University of Rhode Island (URI) motto, “Think Big, We do!,” the Rhode Island Economic Development Corp. (RIEDC) is working hard to position the state as “a premier hub for maritime activity for decades to come. “ The message? If it’s on the water, in the water, under the water or about the water – you’re going to find it here. 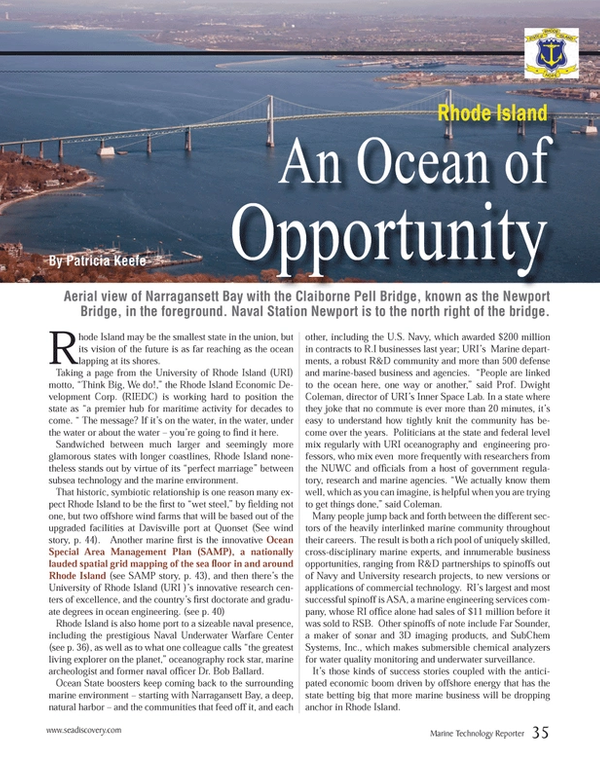 Sandwiched between much larger and seemingly more glamorous states with longer coastlines, Rhode Island nonetheless stands out by virtue of its “perfect marriage” between subsea technology and the marine environment. That historic, symbiotic relationship is one reason many expect Rhode Island to be the first to “wet steel,” by fielding not one, but two offshore wind farms that will be based out of the upgraded facilities at Davisville port at Quonset. Another marine first is the innovative Ocean Special Area Management Plan (SAMP), a nationally lauded spatial grid mapping of the sea floor in and around Rhode Island, and then there’s the University of Rhode Island (URI)’s innovative research centers of excellence, and the country’s first doctorate and graduate degrees in ocean engineering. Rhode Island is also home port to a sizeable naval presence, including the prestigious Naval Underwater Warfare Center (see p. 36), as well as to what one colleague calls “the greatest living explorer on the planet,” oceanography rock star, marine archeologist and former naval officer Dr. Bob Ballard. Ocean State boosters keep coming back to the surrounding marine environment – starting with Narragansett Bay, a deep, natural harbor – and the communities that feed off it, and each other, including the U.S. Navy, which awarded $200 million in contracts to R.I businesses last year; URI’s Marine departments, a robust R&D community and more than 500 defense and marine-based business and agencies. “People are linked to the ocean here, one way or another,” said Prof. Dwight Coleman, director of URI’s Inner Space Lab. In a state where they joke that no commute is ever more than 20 minutes, it’s easy to understand how tightly knit the community has become over the years. Politicians at the state and federal level mix regularly with URI oceanography and engineering professors, who mix even more frequently with researchers from the NUWC and officials from a host of government regulatory, research and marine agencies. “We actually know them well, which as you can imagine, is helpful when you are trying to get things done,” said Coleman. Many people jump back and forth between the different sectors of the heavily interlinked marine community throughout their careers. The result is both a rich pool of uniquely skilled, cross-disciplinary marine experts, and innumerable business opportunities, ranging from R&D partnerships to spinoffs out of Navy and University research projects, to new versions or applications of commercial technology. RI’s largest and most successful spinoff is ASA, a marine engineering services company, whose RI office alone had sales of $11 million before it was sold to RSB. Other spinoffs of note include Far Sounder, a maker of sonar and 3D imaging products, and SubChem Systems, Inc., which makes submersible chemical analyzers for water quality monitoring and underwater surveillance. It’s those kinds of success stories coupled with the anticipated economic boom driven by offshore energy that has the state betting big that more marine business will be dropping anchor in Rhode Island.